Posted on March 3, 2017 by Clara Halpern. Les Levine’s work Wire Tap (1970) is currently on view at Oakville Galleries in the exhibition Les Levine: Transmedia. The work is presented in a dedicated room, where twelve speakers encircle the space’s three walls. 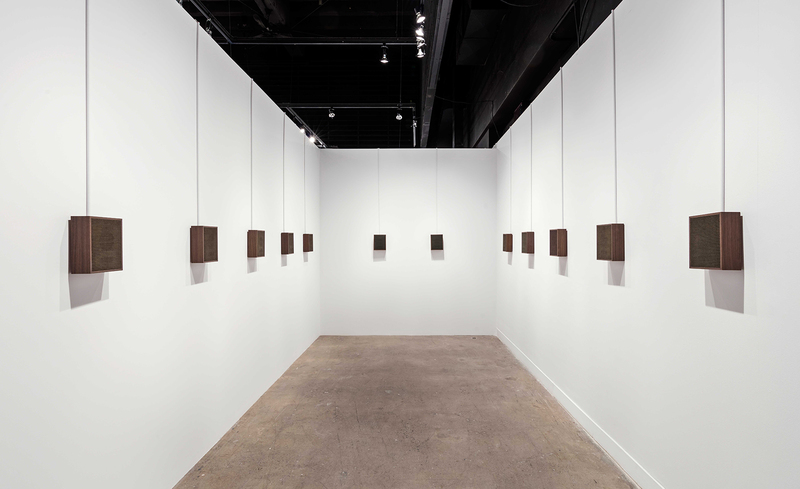 The speakers play a loop of twelve hours of telephone conversations recorded by Levine from his personal phone conversations about the production of artwork over a yearlong period. The work was originally presented at New York’s Fischbach Gallery in 1970, and was acquired shortly thereafter by the National Gallery of Canada in 1971. When Wire Tap was originally installed it used recorded cassette tapes. Cassette tapes first emerged in the 1960s but rose to prominence culturally during the 1970s and 1980s. Curator Barbara London has noted that because their relatively low cost, audiocassettes brought new possibilities for presenting and sharing sound and rap art. Despite that accessibility in recording and sharing as well as portability that the cassette offered, it was gradually crowded out by CDs and more recently digital technologies. There has of course been a localized reemergence of cassettes in certain genres, but for the most part it has been steadily on the decline. In 2011 the Oxford English Dictionary even attempted to remove the word “cassette player” from its 12th edition Concise version. This situation presents an interesting scenario for artists and museums, of whether to continue presenting a work in a format that is becoming obsolete for continuity, or whether to make the shift to a technology that can be more readily conserved for the future. For a fascinating account of the research that can be required for making this type of change, Conservator Ben Fino-Radin’s gave an in-depth account of MoMA’s restoration of Teiji Furuhashi’s Lovers (1994). In the case of Wire Tap, it still uses the work’s original speakers, and the National Gallery of Canada’s team transferred the original work to digital media players, but it hasn’t lost the ambient sounds of the original recording. As technology evolves ever more rapidly, contemporary artists and conservators both find themselves tackling challenging questions of exhibition and preservation within the span of an artwork’s life, questions that will need to be addressed for time-based works in the years to come. There will be an opportunity to listen to Les Levine in conversation with curator Sarah Robayo Sheridan on Thursday, March 9, presented in partnership with the John H. Daniels Faculty of Architecture, Landscape, and Design at the University of Toronto. Image: Installation view of Wire Tap, 1970. Collection of the National Gallery of Canada. Photo: Toni Hafkenscheid.